Here you will find an extremely wide range of different type rivets for any fixing applications. We can offer you best rivets in the market from Gesipa, Rapid, Stanley and Essve manufacturers. A comprehensive filtering system will help you to find correct rivets quickly and easily. 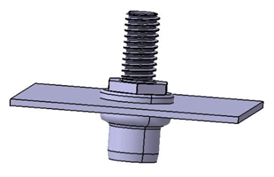 Rivets are widely used for different fixing tasks. There are many different rivet types, but most popular one is blind rivet, because in order to fix materials, you need to have access only from one side. Therefore this type of rivets are called „blind“. At first you must drill a hole in all material layers you want to fix, than insert rivet and finally „tighten“ it until mandrel snapps off. For rivet setting you must use special tool – mechanical rivet gun or electric / cordless / pneumatic riveting tool. Always use metal drill bit with 0,1 mm bigger diameter (example: if you are going to install rivet, which body diameter is 3,0 mm, you must use a 3,1 mm diameter drill bit). It is very important not to go out of the rivets grip range (example: if you have to connect together a few material layers with a total thickness of 2,00 mm you can not use a rivet with 3,00 – 5,00 mm grip range), because such rivet will not give you a tight connection.